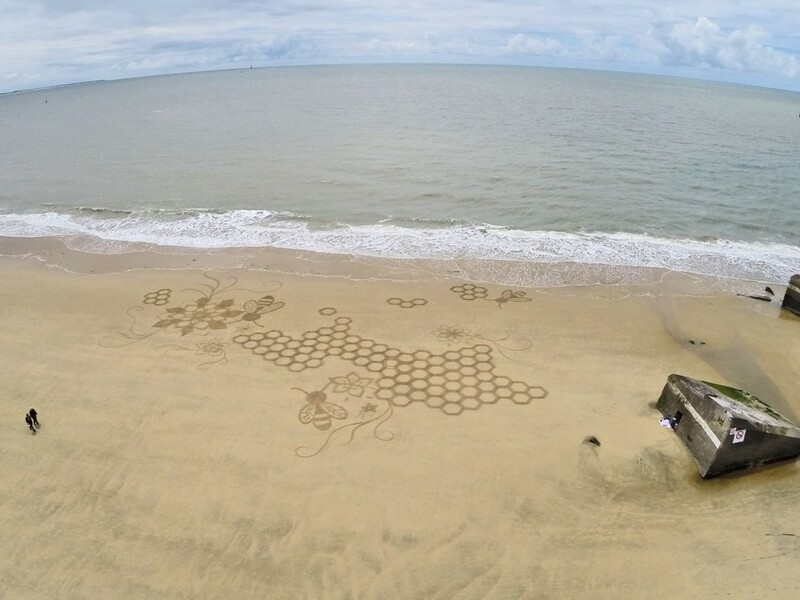 Beach art can be a great way to leave a trace and mark the spirits by passing a message outsized. So I happen to be contacted to participate in collective action with the aim, in addition to a work permit to make a beautiful picture full of meaning through this and try to increase the media will of the action. If the cause is noble and praiseworthy, I participate as much as I can. It can also happen sometimes that I am at the initiative of the message, as was the case for the tribute to Charlie Hebdo. 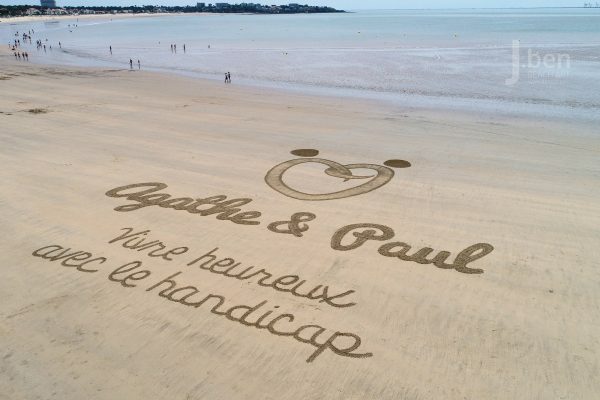 The association “Agathe et Paul” implements actions to raise funds to enable health professionals such as physiotherapists, psychologists and speech therapists to learn about specific therapeutic techniques. The association also helps the families of 2 children and allows other families to benefit from support for these therapies. They contacted me because they challenged themselves to allow Paul to participate in the Royan Marathon. 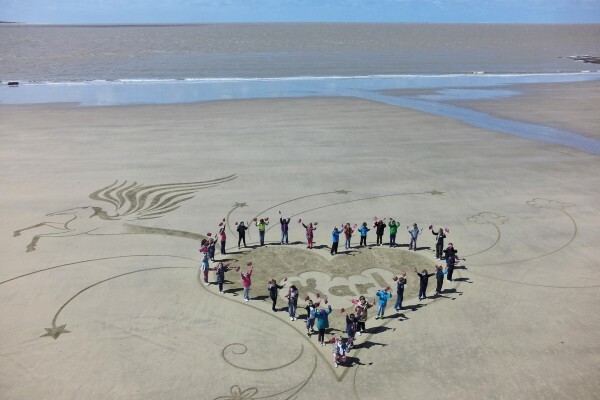 I then realized a beach art for the occasion on the beach of Royan, which allowed them to benefit from the visibility of the marathon to raise awareness about their actions. 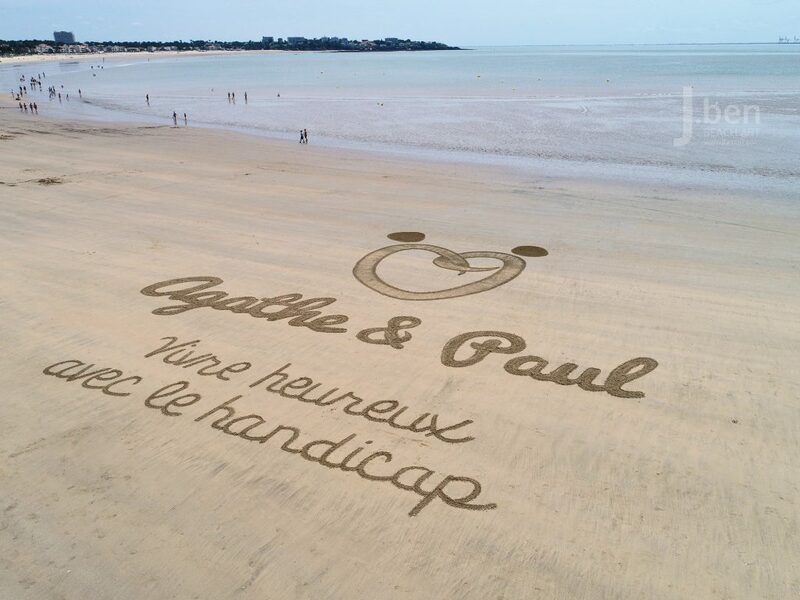 Website of Agathe and Paul. 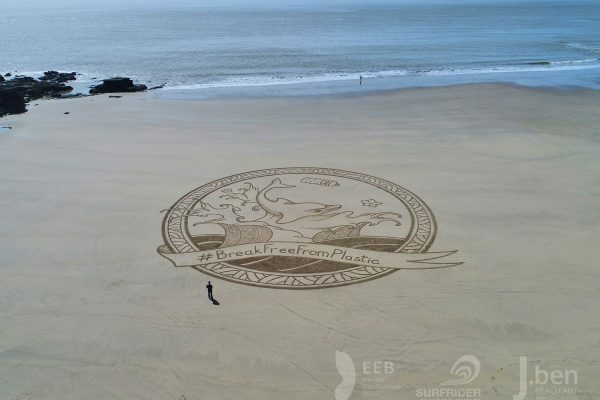 The European Environmental Bureau contacted me to create beach arts to raise awareness about plastic pollution in the oceans. 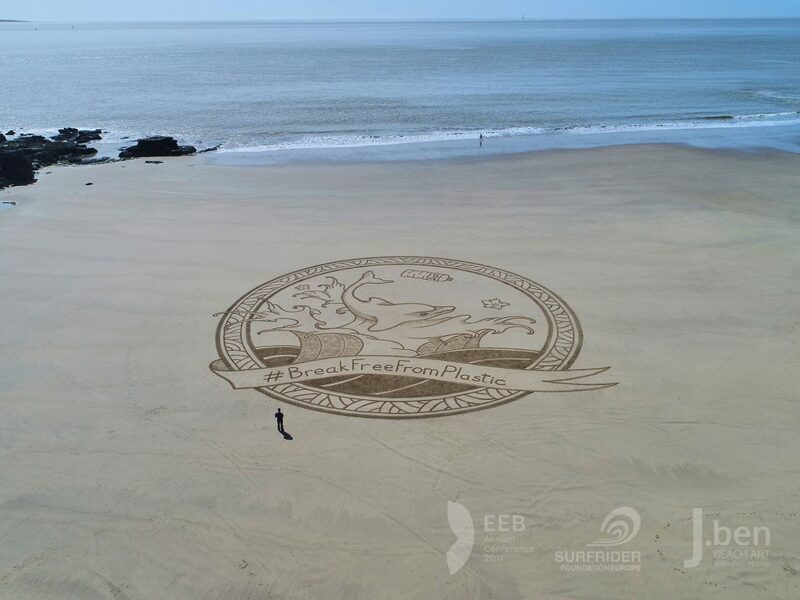 We had a long discussion about the project and their desire to have a European aura to reach the greatest number led me to propose them to realize several beach art in different countries. This is how I offered to collaborate with some of my favorite artists, who naturally agreed to participate in this beautiful project. 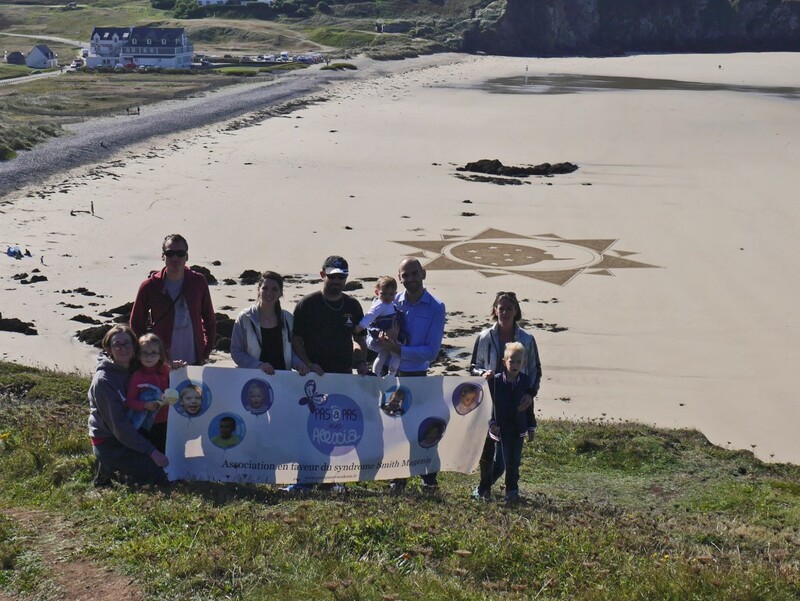 I was then accompanied by Marc Treanor, Marcelo Van ES and Tim Hoekstra, to realize 6 beach arts in total on the beaches of England, Spain, Holland and 2 realized by me in France and Portugal. Several videos have been produced and broadcast on social networks for the awareness campaign. It was also an opportunity to work closely and get to know my counterparts across borders! 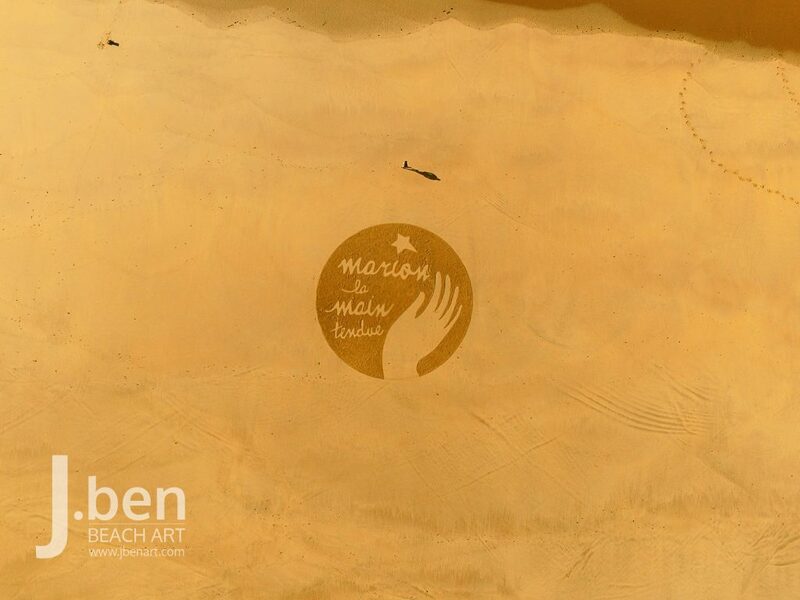 The association “Marion la main tendue” whose headquarters is located in the Paris region has used my skills to make a piece of art on the beach in tribute to the little Marion. The purpose of this association is to fight against violence and harassment in schools. For this purpose, they carry out prevention activities by offering workshops and conferences in schools. They also offer support to families and victims facing these attacks. 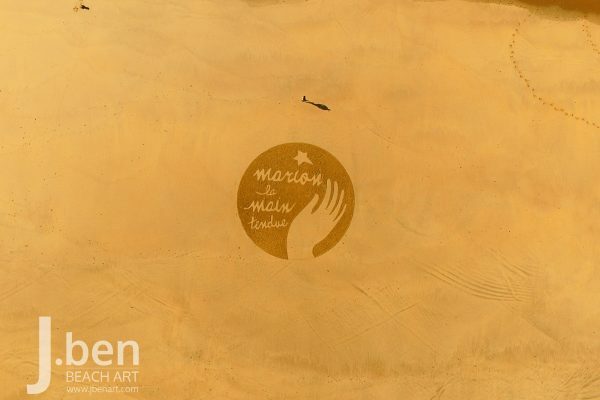 The website of the association: Marion la main tendue. 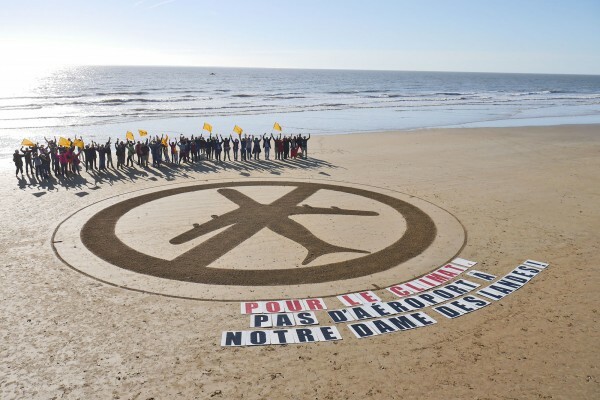 The collective Indre / St Herblain in support against the proposed airport at Notre-Dame-des-Landes, at the initiative of Joëlle Ronnachmore Nicolle invited me to realize their symbol of the aircraft crossed, Vendée on a beach. 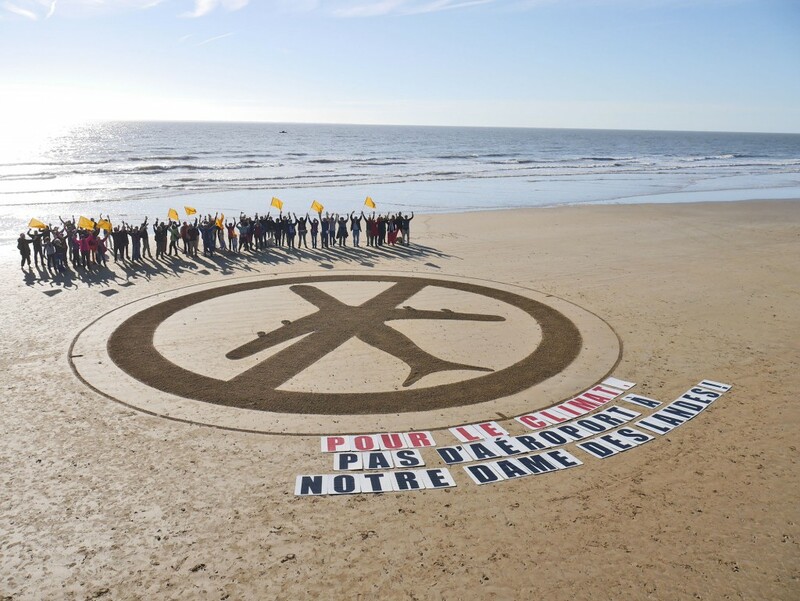 By this action, they want to demonstrate once again the fragility of sensitive areas, as are wetlands, sand coasts eroded by the rising waters, and excessive exploitation for concrete for major useless projects and taxed (GPII). I was invited to Britain by the “Pas à pas avec Alexia” whose action is to raise awareness about Smith Magenis syndrome, as well as to support families with one child carrying the syndrome. This syndrome is a rare syndrome is often not detected because very few hospitals have specialists able to do so. Children are so often labeled as autistic when they require more attention in their monitoring. 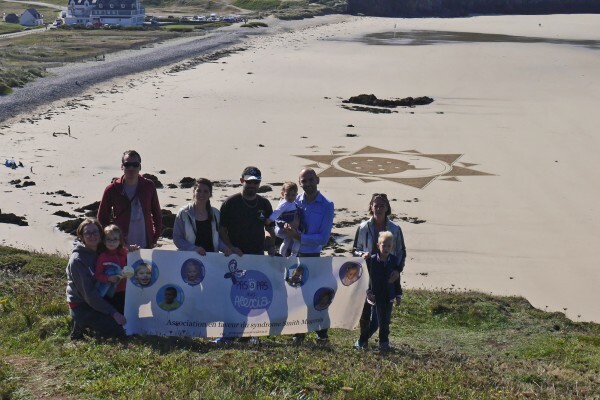 This beach art of a sun that includes a moon symbolizes the reversal characteristic of the syndrome sleep cycle. At the initiative of parents and the teacher of the class of little Karl, I was invited to make a drawing to raise awareness throughout its history on organ donation. Little Karl was waiting at the time a heart transplant. 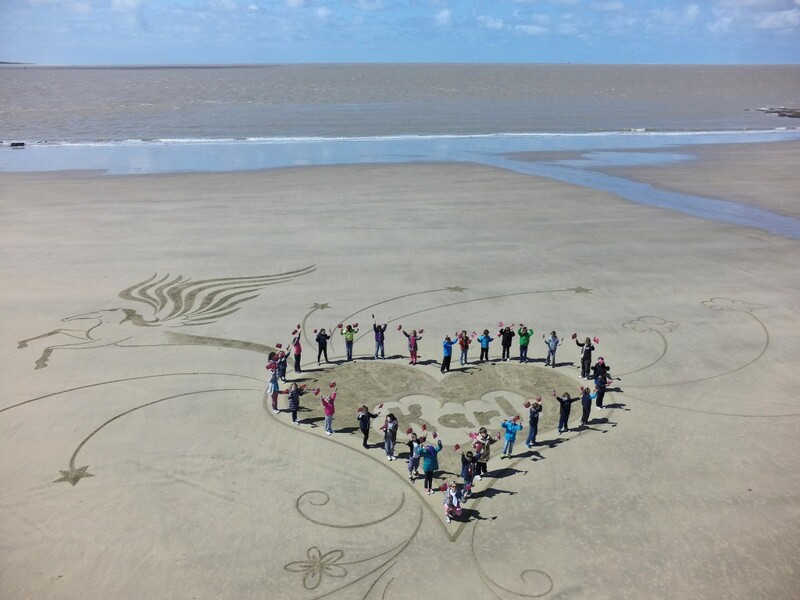 We did surprise him to draw on the sand, a heart with a pegasus reflecting his passion for horses and courage in turmoil. His classmates helped me in the middle of filling and then took the pose around it to make a nice picture. To date, little Karl was grafted successfully and devours life full tooth! The unfortunate events surrounding Charlie Hebdo have highlighted the debate on freedom of expression. 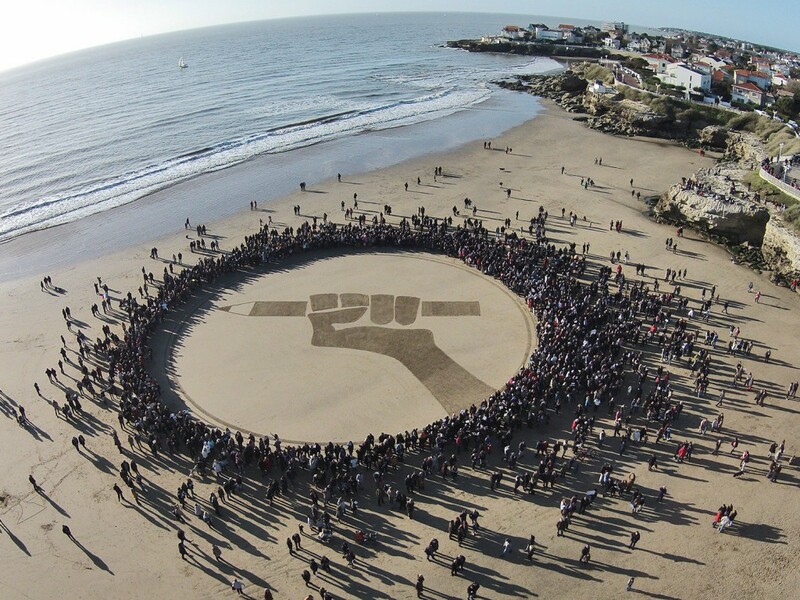 As an artist, although I rarely put into words my work, I wanted to defend this idea and especially to honor them with this brandished pencil drawn in the sand. 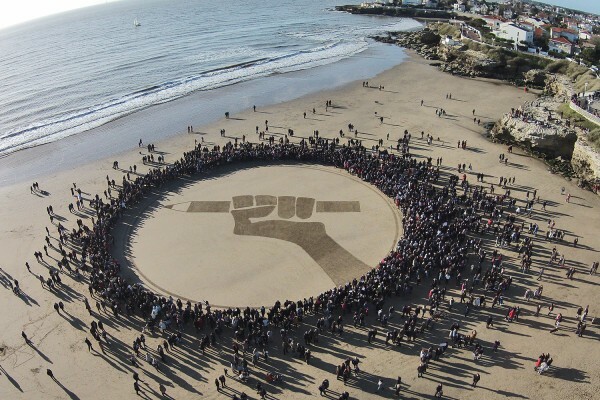 The idea was to make the tribute only with friends around the design, but it quickly became an official rally in Royan, due to word of mouth. Thus we found ourselves to thousands around the design to capture this picture that went round the world. A sensitive issue as that of protecting bees! 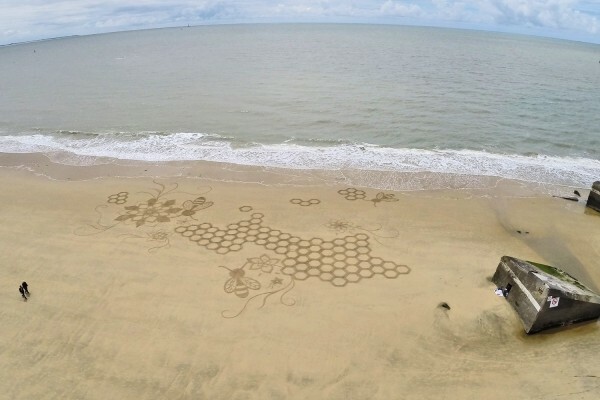 A roof for bees contacted me to make a drawing, to draw a parallel between the fragile life of the bee and the ephemeral aspect of beach art. A video was then carried out for this website that offers to sponsor beehives and in return receive the fruit of honey collection. You can particularly see this video on my Youtube channel and sponsor a beehive on their website. Error: Error validating access token: Session has expired on Monday, 05-Nov-18 05:38:02 PST. The current time is Monday, 22-Apr-19 08:06:32 PDT.